"Minding the Gap" was a lifetime in the making—an account of the lives of skateboarding friends on the cusp of adulthood, one of whom is the movie's director-cinematographer Bing Liu. It would be impressive even without the palpable sense of connection and understanding that Liu brings to the material, but its easygoing intimacy is what puts it over the top. The focus of the film's marketing is the skateboarding, but while that footage (both archival and recent) is elegantly shot and cut by Liu, a natural born filmmaker, it forms a small portion of the running time. 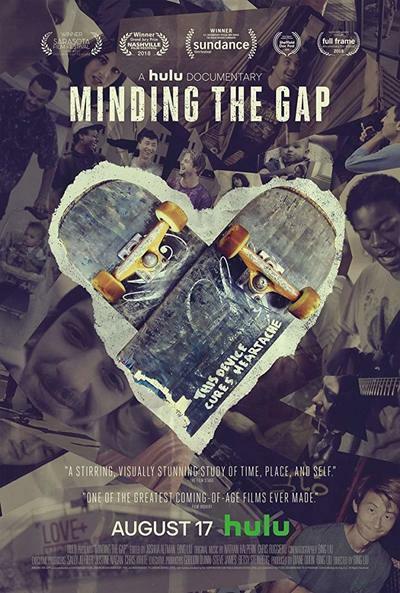 Most of "Minding the Gap" is about the struggle to move out into the world as an adult and become a decent, functioning human being despite a lack of economic opportunities and (maybe more important) a poisonous cultural upbringing that teaches young straight men to hold emotions in, laugh off pain, and express frustration through anger and violence. The result works equally well as a vibrant document of the youngest generation of American men circa 2018 and as a timeless portrait of friendship that could be shown as part of a double feature with "Diner," "Boyz N the Hood" and "I Vitelloni." The movie is executive produced by Steve James of Chicago's Kartemquin films, the company behind "Hoop Dreams," "At the Death House Door," "Life Itself" and other superb nonfiction films, and it shares their sense of rootedness. This movie doesn't just give you the general outlines of its main characters' lives and send you out wiping away tears; it paints a vivid picture of lower-middle class life in a depressed American city (Rockford, Illinois) that movies rarely show us. Liu appears onscreen infrequently, as he's typically the one holding the camera. When the film is in motion, we're following one of the other young men as they zip along sidewalks and over and around obstacles, jumping and cornering and trying to one-up each other. Liu is an invisible presence, except when we see the shadow of his camera with its small shotgun microphone cast on the sidewalk. When the film is standing still, it's recording interviews with Liu's friends and their family members and significant others, occasionally cutting to reacting shots of Liu asking questions. Liu's subjects include Keire, the lone African-American in a mostly white skateboarding scene (and a character whose double-outsider mentality connects with the Chinese-American Liu); Zack, the de facto leader of the group, who suddenly finds himself catapulted into adulthood when he gets his girlfriend Nina pregnant; Nina, who grows in maturity and confidence when Zack struggles to measure up to his responsibilities; and Liu and Keire's mothers, both of whom prove to be generous and insightful subjects, even though they're less comfortable being interviewed on camera than members of the YouTube generation. and tend to shut the door on Liu when his queries cut close to the bone. Fatherhood is a major subject of discomfort. It's examined most visibly through Liu's interviews with Zack, who's so charming and observant that you don't immediately notice how depressed, resentful and self-destructive he is. (In the movie's most vivid instance of self-awareness, he asks the filmmaker if they're doing the sort of interview where he pretends that the camera's not on him, or the sort where he acknowledges it.) Zack loves his girlfriend and young son but fights with her all the time and ends up seesawing between being a sensitive and loving father and an absent presence. He's trying, but he's a mess. In time, we start to understand why this is. Several of the young men in "Minding the Gap" endured childhood abuse that was characterized as "discipline," and it's clear that the experience deformed their sense of what it means to be a father and a man. Even when Liu's male subjects seem keenly aware of the damage done to them, and the necessity of overcoming it for the sake of their happiness and that of future generations, they lack meaningful conceptual tools with which to process and analyze what happened, which means they're at risk of repeating the cycle of misery that affected them as children: paying it forward in the worst way. The women—represented mainly by Nina and Keire and Liu's mothers—are trapped in their own cycle, struggling to love and understand the men who often make their lives miserable. Liu's generosity as a filmmaker refuses to consign any character to either/other categories. They're always both/and. You like them, you want them to succeed, you understand why they are the way they are, and yet at the same time you're allowed to be frustrated with their inability to see themselves clearly and change their lives. It's all honest and true to the experience of being alive—a maddening emotional tangle. Keire absorbs and radiates the audience's empathy. He seems incapable of hiding what he's feeling. His sensitivity to his own trauma and that of others gives the film a lot of its gut-punch force. He's as tough as the rest, yet paradoxically the one who cries most openly, often when contemplating his troubled childhood (his father beat him, yet he still worships the man) and the sacrifices his mother made. Keire is also the means by which the movie conveys its subtle racial critiques. He's usually the character who makes the others aware of their whiteness (an advantage he and Liu will never have), yet because he phrases observations as jokes or teasing asides, they tend to spark conversation rather than shut it down (though sometimes his statements just sort of hang in the air, unacknowledged). Liu captures the visual texture of small, cluttered homes and front yards, the desolate expanse of depopulated downtowns, the bustle of the construction site and fast food restaurant where two of the main characters work, and the noticeable way in which the characters' spirits life when they're on their skateboards tear-assing around town, versus when they're dealing with their often-crushing responsibilities and cultural and historical forces that are bigger than any one person. The Rolling Stones lyric "What a drag it is getting old" might spring to mind more than once. When these characters put wheels under their feet, they return to bliss, but in the end, the experience always reminds them of what once was, and can never be again. "This device cures heartbreak," says an inscription on one skateboard. It's true, for a while.